This week, I have had some opportunities to do some home visits with various members of the Spring of Hope team. It's been a huge learning experience because of the cultural differences and norms of what is in homes in villages in Uganda compared to what is in homes in the United States. The roles of children are also very different culturally, so that completely changes what I am used to in my job! Luckily, Moses (the occupational therapist on the SOH team) showed me a book that he had called "Make it in the Community," which is a guide on how to construct adaptive equipment with items found in rural villages. It gave me a little bit of a better idea of how to work on a very minimal budget. 1) A girl named Josephine - Josephine has Cerebral Palsy. Her legs were casted because they were internally rotating. She is another one who has made a lot of progress. She is working on walking independently. 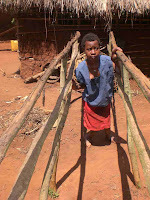 Parallel bars were constructed for her in front of her home. She practices on these several times/day. Parallel bars made out of large sticks were quite impressive to me! I was also amazed that they seemed quite stable. 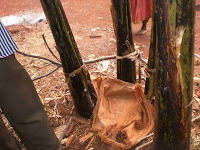 This apparatus is a great use of natural resources.. You won't find these in the West! 2) A boy called Emma. He has epilepsy and has not been getting medication. He has high tone in his arms, and has gotten extremely weak in his legs. He can no longer stand or kneel. He also has a hard time sitting because he gets tired from holding his head up. He really needs to begin by increasing his trunk strength, so we can gradually get him strong enough to stand and kneel. Because this situation needed a quick fix, and could not wait for a special chair to be made - Mawazi and I constructed a seat for him out of Banana leaf trees in their yard behind their home. This seat will give him more stabilization and allow him to build up some of his trunk strength, so he can gradually work up to being able to use his legs again. 3) A girl called Naume. This girl has made so much progress since Spring of Hope started seeing her several years ago. It was encouraging to read about all she has accomplished. She is walking on her own, and now needs to address some activities of daily living. The family was encouraged to have her start working on independence in dressing. Children in this culture are responsible for daily chores, so we brainstormed some activities/chores that she could help with. 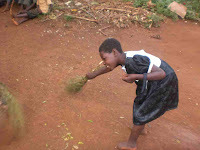 The picture here shows her practicing using a broom to do some sweeping. This activity can be very good for her because it is purposeful and it helps her to work on strength, mobility, and balance.